It creates trends, changes law, moulds opinions. You don't choose to join it. You can only choose to leave it. Some people find it easier to simply follow the crowd. We've always gone our own way. Marched to our own drum. trend, a taste, a fad, or a fashion. Beer that doesn't need to be flavour of the month. Beer, that just like the people who drink it, has a unique character. Beer for people who know what they like to drink. Beer that pint by pint, drop by drop, stays true to itself. Take a taste, and start your own march. Rolling to his own rhythm. Living life to his own beat. Leading the march, not just following the music. A free spirit, freestyling from the depths of his soul. Roy's always seen the world in a different light. You could say he was born that way. Blind from birth. But never letting it hold him back. Because what Roy lacks in sight he makes up for in vision. Never seeing problems. Only possibilities. Never seeing boundaries. Only the chance to smash them. You can hear it in every boom of bass and snap of snare. 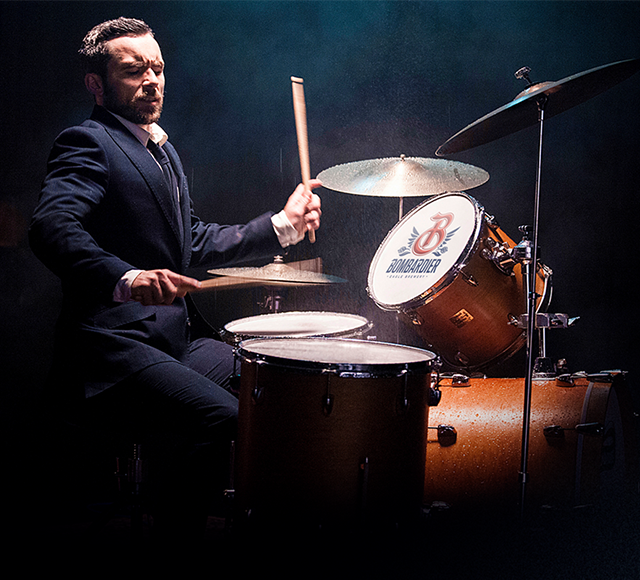 A drummer defined by ability.